It a small plates world, Bombay Club offers the Indian way to eat a little bit of everything. These samplers are known as “thalis” and the Best Thing on the Menu is most definitely the Club Thali – fish, chicken, lamb, vegetable, dal, lemon rice and raita. Thali eaters are privy to the holy trinity of curry proteins: chicken, lamb and fish along with veggie accompaniments like lentils and spinach as well as the requisite starches, naan and rice. We have yet to go to another Indian restaurant in DC that offers thalis, but will certainly be on the lookout. 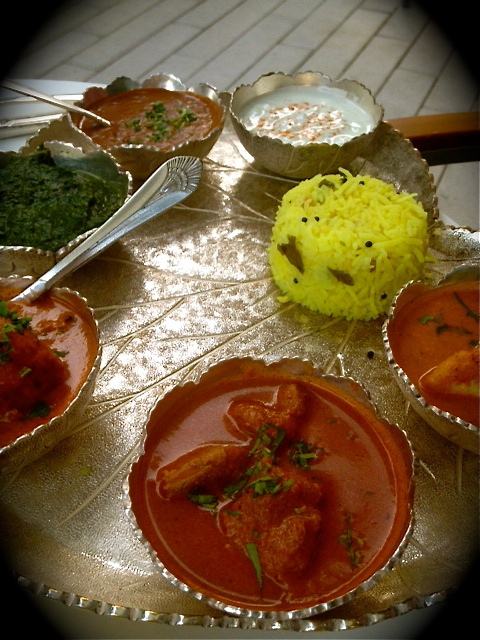 For more on thalis, check out CNN’s coverage of Mumbai’s best eats. Bombay Club was Ashok Bajaj’s first restaurant, opening its doors before Rasika and Rasika West End, which also serve delicious and adventurous Indian, but with less of a Washington feel. Steps from the White House, Bombay Club has a real special air to it. The dining room is elegant, the service is top notch and the quiet atmosphere lends itself to easy conversation. Our waiter informed us that Bombay Club is of great importance to Bajaj, who visits daily (sometimes several times) to ensure that everything is meticulously in its place. This makes sense seeing that the restaurant has hosted the likes of U.S. Presidents Bill Clinton and George H. W. Bush, President Nelson Mandela, Bruce Willis and Harrison Ford to name a few. In addition to being a little more formal and stately than its Indian cousins Rasika and Rasika West End, Bombay Club is also a little more spicy. We particularly liked the lamb shank dish, which tasted like Christmas on a plate and brought some gentle heat. Club Thali not your BTM? Post your favorites in the comments section.